This week Southampton-based piano-playing singer-songwriter Luke Leighfield is to release his 3rd full-length album, 'Have You Got Heart?'. Since 2006 Leighfield has played hundreds of gigs both at home and abroad, going as far as Russia and China. In addition to this, in 2008 he played at the Latitude Festival and The Great Escape Festival, as well as radio airplay on BBC Radio One, XFM and BBC 6 Music. This was all done whilst completeing a Degree in English and Music at the University in Southampton, which he completed with 2.1 honours earlier this year. Alter The Press! recently spoke to Luke about the new album, offering the album as a free download, running his own label, playing shows in China and Russia, being a full-time student and touring musician at the same time and much more. ATP: So Luke you're just about to release your new album 'Have You Got Heart?' What can we expect from your 3rd album? Luke: The main difference with this album is that there's a lot more guitar on the record. With the first album I tried to basically use no guitar, and my first foray into having guitar on my music was on my second album. With this album I wanted it to sound pretty rocky so I found a great guitarist and basically made him play wicked stuff all over the album. Apart from that, the production is a lot better than my old albums. Pete Miles did a great job of mixing the ridiculous amount of instruments on the record and it sounds sick. It's just a big more full-on than than the previous albums, but essentially a continuation of what I was already doing. ATP: I understand 'Have You Got Heart?' has a more grand sound with trumpets, trombones and even a choir being used. Could you expand on this? L:Well basically it's not a lot different to the instrumentation on my previous albums. However, the difference is that all the brass and strings are kind of used throughout each song, as opposed to just being brought in at the end of tracks to give them epic endings. So the songs are written in more of a full band sense throughout the song, rather than being me playing solo with stuff tacked on top, if that makes sense? As for the choir, it was basically just everyone on the album stuck round a mic singing like rowdy football hooligans. ATP: For those who may have not heard your music before, how would you describe your sound? L: Obviously it's piano-based, so you can compare it to Ben Folds, Jacks Mannequin and The Rocket Summer. Then there's a rocky slant that I like to say is a bit Paramore-esque. Then there's loads of ridiculous eighties-influenced guitar and drum bits that come from my love of Queen and Toto. So it's basically a combination of all my favourite bands in one glorious pop melting pot. ATP: Are there any artists or bands that have influenced you and especially this album? L: There's a track called 'I Won't Look Back' which is a mid-tempo pop ballad, that I feel came out of listening to a lot of The Fray's first record. It's basically really simple, and its basis is a big, beefy drum sound with a simple melody over the top, but it's turned out to be a lot of people's favourite song from the album and I'm really proud of it. I hate it when bands go on about how they've matured, but this is a mature song for me that I don't think people will have expected me to write. I'm also really proud of all the arrangement on this song. There's some U2-esque guitar sounds, even though I hate U2, and a really gorgeous string arrangement. ATP: This past summer you finished University with a 2.1 degree in English and Music. How did you find the time to do a degree and your own music? L: The hardest time was in my second year of uni. I'd just had a year out to play for Get Cape Wear Cape Fly, and then I'd done loads of touring with Sam Isaac for eight months, and when I came back I tried to maintain the same intensity of gigging. I think that in that academic year I still managed to play about 200 shows. It was pretty stupid. I'd leave for a gig at 4.00 after lectures, play it, leave at midnight, arrive back at 2.00 or 3.00, then get up for lectures at 8.00. And I was clocking up about two or three of those in the week, then always gigging on Saturday and Sunday. I'm lucky though, because English and Music aren't as intense as studying something like Medicine or Physics or whatever, so I just about managed to get away with it. I only just got a 2:1 that year then tried to put a bit more effort in in my third year, when I slowed down my gigging slightly! ATP: Is there any advice you'd give to someone in a similar situation? L: Gig as much as you can. I really believe that gigging is a surefire way to build a fanbase, and means more than promoting yourself on the internet. It shows that you're putting effort in and getting out there and playing to people. It was kind of easy for me because I had my own car and I was playing most of my gigs solo, but I guess if you're in a band and trying to get four people together to do all these gigs then it's a lot harder logistically. However, I think solo artists have a big opportunity in that they can play in random pubs and living rooms or whatever, whereas bands require a venue with a decent PA to be able to perform. ATP: You're offering your album as a free download. What was the reason behind this? L: My previous two albums had some great songs on them, but were recorded on a shoestring budget, i.e., basically for free. So a few people have been put off my music by the production being a big ropey, and also by my vocals and other stuff. Since recording 'Fan The Flames' in summer 2007, I've had the experience of two years of gigging and vocal lessons, and also listening to loads of new music and getting better at writing songs, so this album is basically hugely better. I want everyone that has maybe written me off or been put off my music to be able to try out this new stuff, and not to be put off my a price tag or having to bother to place an order in my online store. It's literally as simple as clicking 'download' and then people can check out my new stuff and hopefully re-evaluate their opinion of my music. I just want this album to be heard by loads of people all over the world, and for people to be able to share it with their friends. ATP: Do you think music has lost its value, as many artists are now giving away their music? L: Yeah, there is a danger of that happening. However, I'm also offering a physical package so it's not like I've totally neglected that side of things. I personally don't ever download music legally or illegally, and hate the idea of music not being available physically. I think that when a band releases stuff exclusively digitally it's just a bit weak. As a fan, I want to be able to hold the artwork and look at photos and stuff, and iTunes just seems a bit clinical and lame. ATP: Alternatively you're offering 2 physical packages for the new album. Could you tell us about them and why you're doing them? L: I've just tried to put together two packages that I personally would want to buy. The album is going to be packaged in a hand-numbered, 40-page CD photo book, limited to 1000 copies, which contains photos of the album recording taken by my friend Tom Price. He's a sick photographer, and it basically just shows the recording process and all the stuff that went on. Pete Miles' studio is in a beautiful location so it's nice to see that too. There was also an option to pre-order the album with a limited edition t-shirt, which was made to order. I love bands that do these pre-order deals so I just did one myself. ATP: What are your thoughts on services like Spotify? Do you think they are ideal for artists like yourself? L: As far as I'm aware, artists don't really benefit financially from Spotify, however there are loads of benefits to it. Consumers can hear entire albums without actually owning them, and then can make an informed decision about whether or not to buy an album. However, the issue is whether people will ever actually fork out for an album if they can hear it whenever they want anyway, provided they're in their home. I do love Spotify, and I think one of the best things is how you can share your playlists. I have a playlist that contains my favourite songs and stuff that I'm currently listening to, so that people can have a listen to it if they want to know what I'm into at the moment. Essentially, Spotify is great but people need to realise that if they want to help an artist financially, and thereby ensure that they can keep making music, they need to pay for the artist's music. ATP: You also own your a label called Got Got Need Records. Why did you decide to form your own label instead of joining one? L: Most indie labels operate on a 50/50 split after costs between label and artist, and I simply can't afford to throw away half the money from every CD I sell. A record label often sounds like a grand term, but it basically means that I organise all the artwork myself, get quotes from the CD manufacturers, then send all the artwork and everything away myself and pay the bill at the end of it. Then, when the CD is made, I try to get a few reviews, interviews, and a bit of radio play. I don't want this to seem at all offensive or arrogant, but I feel that there's not a huge amount more that any of the small independent UK labels could do for me. Obviously each label has a dedicated group of people who are likely to buy, or at least seriously consider buying every release, but having weighed up the positives and negatives of doing it myself as opposed to attempting to get an indie label on board, I feel like doing it myself is the best route for me personally. I think that's only because I've been blessed with quite a good work ethic, and I'm also a control freak, so getting someone else onboard would just frustrate me! If you're in a band just for the love of making music and you despise all the business side of things, then obviously it would make sense to get the backing of a label to handle all of that for you. However, I love all the aspects of releasing a record, even though it's often painfully stressful, and it's nice to know that when I get the finished product in my hands it's because of my hard work. ATP: During your career you've played across the world including Russia and China. Have these experiences influenced your music and as a person? L: Probably the biggest effect that it's had on me is that it's made me worry less about the UK. I used to get stressed about how I wasn't really getting any bigger in the UK, and get frustrated at just doing the same tour round the UK every four months or whatever. Touring other countries means that you get to break it up a bit more and keep touring a bit more fresh, rather than just finding yourself in the same venue in Leeds four times a year! So even if I play a rubbish show in London, then I can go to Moscow and play a great show. And if there's a rubbish show in Frankfurt, then I can come back and play a cool show in Southampton. It keeps everything more interesting. I don't think that the touring has really influenced my writing, but it's definitely made me aware that there is more to the world than the UK. I think we're pretty self-important about our music scene in the UK, but there is cool music being made everywhere and it's good to not lose sight of that. ATP: Do you have funny or memorable stories from these shows? ATP: How was the reaction to your music overseas? L: It seems like the further I travel, the more receptive the crowds are. I think it's because not many UK bands get out to Russia or China, and therefore the people there are extra appreciative that you're there and playing for them. Wherever you go, people LOVE the UK and talk about all the bands they love from there, so I think people were also just nice to me because I was from the UK! Some of my best shows have been in Moscow. The bookers out there are really good and always sort out a great crowd for me, so I'm really grateful to have had that opportunity. ATP:Is there anywhere you'd like to play but haven't yet? L: Everywhere! I'm potentially going to Australia and Japan in 2010 so I hope those dates happen. I also really want to go to the USA and South America. To be honest, I just want to play absolutely everywhere, and see a bit of the world at the same time and hopefully make some new friends. ATP:Speaking of working overseas. You are signed to Rallye Records in Japan. How did that relationship form? L: I saw that Rallye had released stuff by Jeremy Warmsley, Kyte and The Joy Formidable so I just sent them an email to see if they were interested in working with me. It turns out that they were, so I released a Greatest Hits CD out there! Pretty pleased with that one. Someone sent me a picture of my CD in the racks at HMV Tokyo next to Ben Folds. I was so chuffed! ATP: You've played hundreds of shows both big and small. What type of setting do you prefer to play? L: That's a difficult one to answer. You can play to 300 people and it can be awful, and you can play to ten people and it can be the best show you've ever done. I love the variation that my shows offer at the moment, the way that I can be playing a big gig in Munster one weekend, then the next weekend it might be a house show in Huddersfield. Variety is the spice of life! Obviously in the future I want to play bigger and better shows, and take things to the next level, but I'll always enjoy playing shows in different settings and sizes. ATP: What can fans expect when they come to see Luke Leighfield? L: Mostly tasteless jokes. If you come to see me play in front of my friends in Southampton you can expect lots of in jokes, and possibly me crying onstage about some stupid joke. If you come to see me in Kingston you can expect to see Del Noble. That's guaranteed. ATP: As 2009 comes to an end, what can we expect from Luke Leighfield in 2010? L: I'm hoping to get out to some new countries to play as I mentioned earlier, and I might write another album. I'm going to start a post-rock side project. I'm also going to be producing a few bands, and hopefully doing some arranging and stuff on the new King Blues album. 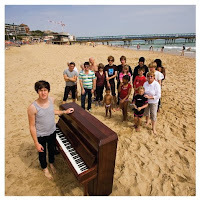 And the new Get Cape album is coming out, which I played a bit of piano on. ATP: I hear you're working with Eat Sleep Attack on his new EP? L: That actually fell through because Sam had to cancel the recording he had booked, but hopefully I'll be able to do that at some point if our diaries agree. ATP: Do you have anything else you'd like to say to finish the interview? L: Well, thank you to Alter The Press for supporting me, and I hope everyone enjoys the new album. Luke Leighfield's new album 'Have You Got Heart?' is available from November 17th on Got Got Need Records.